Based on data from the Ministry of Cooperatives and SMEs of the Republic of Indonesia, 2011, approximately 60 percent of SMEs run by women in Indonesia. "Without realizing they women have an important role in improving the country's economy," said Pinky Saptandari, Advisor to the Ministry of Women's Empowerment and Child Protection told Compass Female , in the event of Katumbiri Expo at the Jakarta Convention Center, South Jakarta. awareness of Indonesian women to advance and develop in the economy and help families and the development of improved seeds of entrepreneurial spirit of women.Conditions of economic crisis indirectly also support the growth of women's entrepreneurship in order to create a personal and family economic self-sufficiency. "But most importantly, these women could help her independence as a human being without having to depend on her husband within certain limits," beber Pinky. No doubt, too, that the self-employed women can have financial independence in the family. "With the economic independence, women can have the power and strength of their own to do anything, as well as open access to all networks. addition, power will also be able to strengthen women psychologically, and avoid any acts of harassment or domestic violence in the household. and this making women a position of bargaining within the family, not meant to beat the husband, but in order not to be trivialized because we also have a contribution in the economy, "said Pinky. Unfortunately, a lot of women that has yet to realize their ability to entrepreneurship. A lot of those things into consideration, such as lack of support from their husbands, or because there is an obligation in the domestic realm that must be done every day. 1. 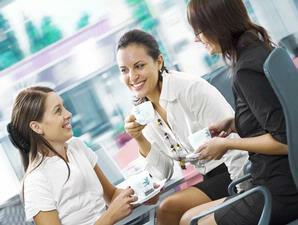 Networking Compared to men, women have the advantage in terms of networking . "Women have an advantage in terms of network marketing, because it has a broad social," he explained. This is because women have the social skills and outgoing, making it easier to be able to capture the consumer. For example, through the gathering. "Many people, especially men, who assume that the gathering just to spend money, when in fact it is one way to build relationships," said Pinky. Today, every woman-especially housewives-bound to follow some social gathering activities simultaneously at one time. If cleverly, according to Pinky opportunities can be used to sell our products such as cakes, shoes or clothes. Women judged more keen to see the business opportunities, and smart businesses see a gap compared to men. Sometimes things terterpikirkan by men and considered a trivial business move, it can be profitable and successful when done by women. 3. PainstakingWomen are more careful in running the business. The details in the business affairs such as packaging , labeling, or other small, highly thought of by women so as to make their products become more attractive, and have a high selling power. 4. Not easily discouraged In business, women are considered more resilient and not easily discouraged when a failure. "She is like the roots of plants are constantly looking for ways to grow and succeed," said Pinky. When faced with failure, women have a high fighting spirit and more impatient to start everything from scratch. Often when faced with the problem of layoffs, women are more resilient in finding ways to survive and put aside her pride to start a business from the bottom than men. "Many employees are finally able to live well thanks to the help of the efforts of his wife who had a side business at home," he added.